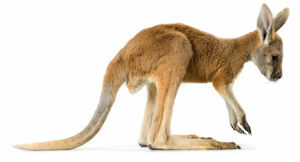 A kangaroo kept getting out of his enclosure at the zoo. Knowing that he could hop pretty high, the zoo officials put up a ten-foot fence. However, the next morning the kangaroo was out again, just roaming around the zoo. The zoo officials raised the height of the fence to twenty feet. Again, however, the next morning the kangaroo was again roaming around the zoo. This kept on, night after night, until the fence was sixty feet high. The kangaroo replied, "Probably a hundred feet, unless somebody starts locking the gate at night!!"